Greetings again from the darkness. Michael Shannon continues to be one of the most interesting actors working today. In this first feature from writer/director Matthew Ross, Mr. Shannon is the titular Frank, and his pained facial expressions elevate this neo-noir into a dark and intriguing exposition on male obsession and sexual jealousy. The abrupt opening scene finds Frank and Lola (Imogen Poots) frolicking in bed after obviously just meeting for the first time that evening. We (and Lola) know we are in for something a bit different when Frank slams on the breaks and states, “Maybe we should wait until next time.” Lola is taken aback, and we are soon watching this relationship develop … while simultaneously noting the subtle signs of troubled pasts for each of them. 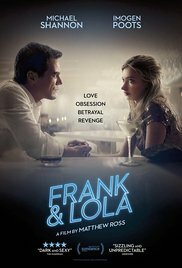 Frank is a talented French chef and Lola is just starting her career as a fashion designer. His dark side flashes a bit more often, but before Lola ever comes clean, we realize there is unhappiness in her past. They seem to be two tortured souls in a jinxed relationship. Filmmaker Ross keeps us (and Frank) on our toes as the script seems to continually offer yet another deeply held secret or mysterious character. Justin Long plays Lola’s new employer, while the rarely-seen-these-days Rosanna Arquette plays Lola’s name-dropping mother. However, it’s Michael Nyqvist (so great in The Girl with the Dragon Tattoo) as the suave Frenchman with ties to Lola’s past and present that really makes things interesting … and somehow even darker. His wife is played by the terrific French actress Emmanuelle Devos. Her screen time is limited, yet crucial. The film was well received at Sundance, and it shares the creepiness of such films as Basic Instinct, Body Heat and Night Moves. Rarely do contemporary movies go as deep into the male psyche of obsession as this one, and the throw-back atmosphere is a perfect fit for the tone. Not many actors simmer like Michael Shannon, and the story offers him the perfect vehicle to remind us that everyone longs to be loved – even when we aren’t sure we deserve it. This entry was posted on Thursday, December 8th, 2016 at 9:29 pm and is filed under Drama. You can follow any responses to this entry through the RSS 2.0 feed. You can leave a response, or trackback from your own site. Michael Shannon, indeed… and this storyline, what a combo, an irresistible one. My movies list to watch is filling up nicely. I find him interesting to watch in everything he does … whether it’s as Elvis, as a hitman, repossessing homes, or as a tortured soul failing at trying to be normal. I also thought he was great in “Boardwalk Empire”. I first noticed him on Boardwalk Empire and all the movies he’s acting in since he nailed, no two ways about that. Have a great movie watching week-end David. Ray, he had some minor roles beginning in the early 90’s, and though I’m not a fan of the movie, he really started showing his unique screen presence in Revolutionary Road (2008). This year, he is also terrific in Nocturnal Animals … a film I would definitely recommend for you. Hope all is well, Ray. Sorry, tablet problem. What I meant was that I like the way you reviewed this movie. You wrote enough to make it interesting but not enough to spoil it…whew! Thanks! I knew nothing about it beforehand, and I think it works best that way.